These RMD payout funds are at the core a target date mutual funds which have a specific accumulation year in the future to better gage your investment risk. An example would be a later dated target date funds, such as the Fidelity Freedom 2020 fund. This funds has 60% percent equity and 40% fixed bonds investment exposure in the fund. It is built for accumulation of assets with a built in asset allocation model. The spin on Fidelity’s new RMD Simplicity payout funds are the same as a target dated fund except it has a built in RMD distribution linked to it with another fidelity withdrawal form required. You would still receive a notification from any other IRA investment that a RMD distribution is required if you are older than age 70 1/2 yrs old. So the RMD marketing spin is just that a way to capture assets at Fidelity from IRA holders. 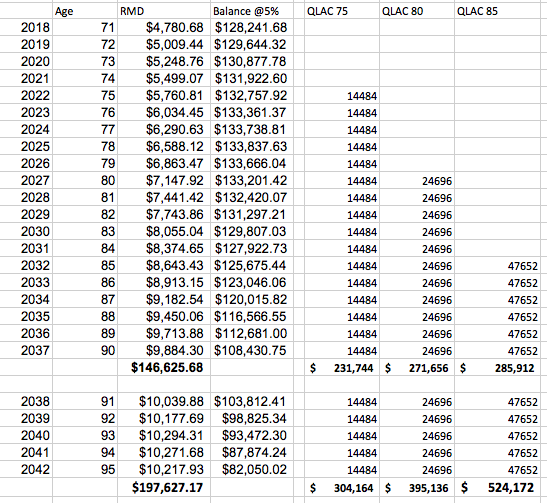 Look into a QLAC (Qualifying Longevity Annuity Contract) which the US Treasury has “blessed” as a way to totally defer RMD income payments until age 85 of 25% of your IRA balance or $125,000, whichever is the lesser of.